An international team of scientists reports the oldest unambiguous hunting lesions documented in the history of humankind. 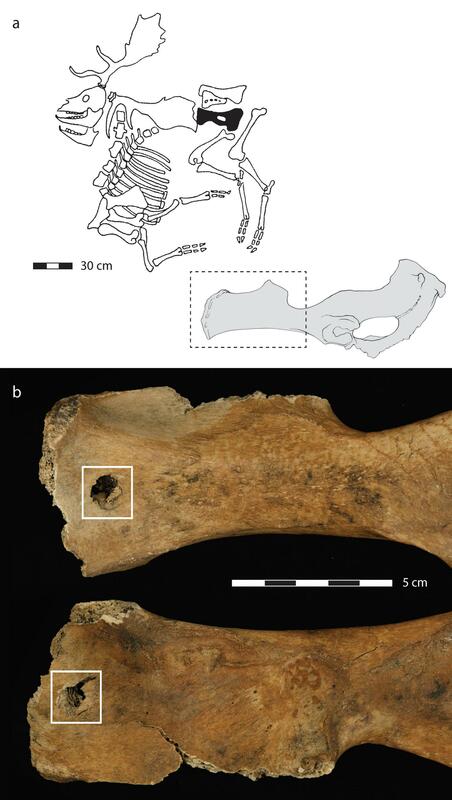 The lesions were found on skeletons of two large-sized extinct fallow deer killed by Neandertals about 120,000 years ago around the shores of a small lake (Neumark-Nord 1) near present-day Halle in the eastern part of Germany. The study was led by Professor Sabine Gaudzinski-Windheuser of the Department of Ancient Studies at Johannes Gutenberg University Mainz (JGU) and was now published in the journal Nature Ecology and Evolution. The study constitutes a significant step forward in our knowledge of the Neandertal niche. It demonstrates how Neandertals obtained their prey, first and foremost in terms of their much debated hunting equipment while also shedding light on their hunting skills. With an innovative experimental ballistic setup including state-of-the-art motion-sensor technology, the researchers were able to reproduce the specific form of one of the lesions. The results prove the use of a wooden thrusting spear that was impacted with low velocity. This suggests that Neandertals approached animals very closely and thrusted rather than threw their spears at the animals, most likely from an underhand thrusting angle. Such a confrontational way of hunting required careful planning and concealment as well as close cooperation between individual hunters. The lake where the hunts took place was surrounded by a close canopy forest, a type of environment deemed particularly challenging for hunter-gatherers, even modern human ones. Interestingly, the excavations in the Neumark-Nord area have yielded tens of thousands of bones of large mammals, including red and fallow deer, horses, and bovids, as well as thousands of lithic artefacts from this uniquely rich Last Interglacial lake landscape, attesting to the success of Neandertal survival in forested environments. "Although hominins most likely started hunting with weapons more than 500,000 years ago, actual evidence on how wooden spear-like objects like those found at Clacton-on-Sea in England as well as in Schöningen and Lehringen in German were used was absent prior to the identification of the Neumark-Nord hunting lesions," stated Gaudzinski-Windheuser. "As far as spear use is concerned, we now finally have the crime scene fitting to the proverbial smoking gun." The research team included Professor Sabine Gaudzinski-Windheuser of JGU, Head of the MONREPOS Archaeological Research Center and Museum for Human Behavioral Evolution, Römisch-Germanisches Zentralmuseum, Leibniz Research Institute for Archaeology (RGZM), JGU researcher Elisabeth S. Noack, who also works at MONREPOS, JGU researchers Dr. Frieder Enzmann und Arne Jacob, Professor Wil Roebroeks from the Faculty of Archaeology at Leiden University in the Netherlands, Dr. Eduard Pop, who works at MONREPOS and at the Faculty of Archaeology at Leiden University, as well as Professor Jonas Buchli and Dr. Johannes Pfleging from the Institute of Robotics and Intelligent Systems at ETH Zurich in Switzerland.